Narwhals are some of the most elusive creatures in the ocean, spending most of their lives in deep water far from shore. But research being presented at the 2018 Ocean Sciences Meeting here on Monday may shed a bit of light on these enigmatic marine mammals. New research shows narwhals may prefer to congregate near unique glacier fjords with thick ice fronts and low to moderate calving activity, where icebergs break off infrequently. It appears narwhals prefer the freshwater coming off still, serene glaciers over the silt-filled runoff discharged from very active glaciers. The findings could help scientists understand a little more about the elusive narwhal and how these marine mammals might fare in a changing climate, according to the researchers. "Arctic marine mammals are really good indicators of climate change because they are very specialized," said Kristin Laidre, a scientist at the University of Washington in Seattle who will present the research Monday at the 2018 Ocean Sciences Meeting, co-sponsored by the Association for the Sciences of Limnology and Oceanography, The Oceanography Society and the American Geophysical Union. "They are finely attuned to specific environmental conditions, so they are good indicator species for how the physical changes many scientists are documenting in the Arctic can reverberate throughout the ecosystem." 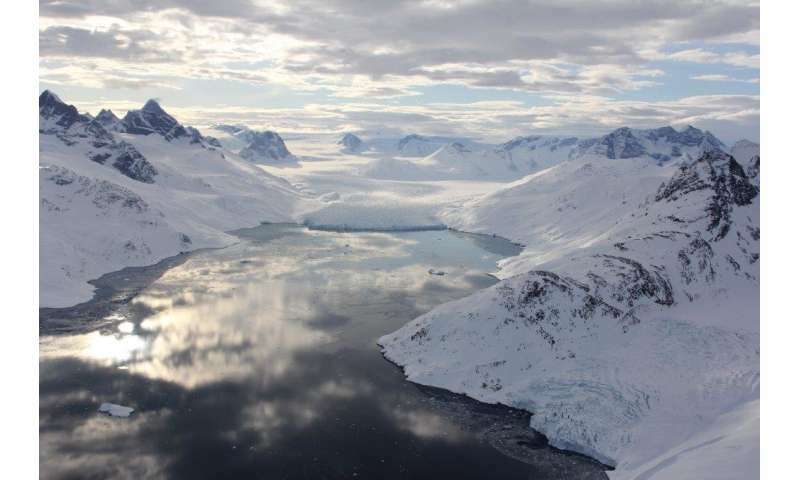 Scientists have known narwhals spend time at the fronts of glaciers in Greenland during the summer, which are hotspots for marine mammals, seabirds and fishes, but they did not know why narwhals have an affinity for these glaciers. A glacier front in Greenland. New research shows narwhals like slow-moving, big walls of ice where conditions are still and serene. Credit: Kristin Laidre. 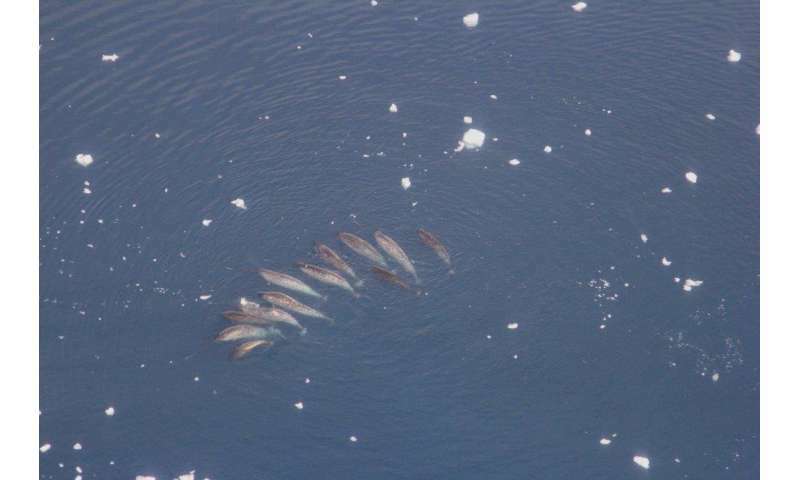 To better understand what glacier features narwhals prefer, Laidre and her colleagues used data from 15 narwhals outfitted with recorders that tracked each animal's movements over four years in the 1990s and 2000s in Greenland's Melville Bay, where narwhals congregate in summer. They combined this data with information about glaciers in Melville Bay over the same time period. The researchers examined how narwhals behaved at the glaciers and collected information about each glacier's physical properties to create models of narwhal behavior and tease out the animals' preferences. "Narwhals like slow-moving, big walls of ice where conditions are still and serene instead of a lot of runoff and disturbance," Laidre said. The researchers don't know why the narwhals prefer these glaciers. They think the freshwater could shock small marine critters that are food for fish, which narwhals eat. Narwhals are also close relatives of beluga whales, which also seek out freshwater in summer to shed their skin, and it is possible there is something similar going on at the glacier front, Laidre said. Laidre and her colleagues are performing additional research using a combination of moored instruments at glacier fronts, acoustic monitoring and land-based cameras to collect year-round data on narwhals to shed additional light on what physical properties of glacial fjords influence narwhal occurrence, relative abundance and acoustic behavior. Laidre is also working on a project to use instrumented narwhals to examine the seafloor and measure ocean water temperatures. The research will help scientists better understand climate change in the high Arctic, Laidre said.